The first winter snowstorm of 2016 is headed for our city. 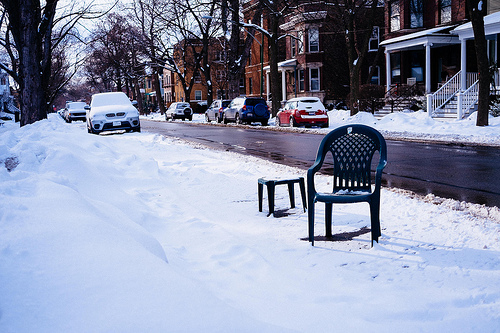 In Philadelphia and its surrounding counties, there is somewhat of a tradition of saving parking spaces with chairs, cones, or some other household item during these blizzards. While legally a person isn’t entitled to a parking spot most tend to follow this unwritten rule during these storms. We’re the City of Brotherly Love after all so this is no surprise! There are, however, incidents where neighbors fight over the “saving of spots” and sometimes these initial shouting matches escalate into physical altercations. There are a number of instances where the “saving of spots” has led to criminal charges ranging from simple assault and terroristic threats to even murder in extreme cases. In Pennsylvania, a person commits a Simple Assault when he or she attempts to cause or intentionally, knowingly, or recklessly causes bodily injury to another person. A simple assault is also committed if an individual negligently causes bodily injury to another with a deadly weapon or attempts, by “physical menace” to put another in fear of imminent serious bodily injury. See §2701(a). So if you get into a fight with your neighbor over the spot in front of your home that you spent 2 hours shoveling, you may be charged with Simple Assault depending on the circumstances surrounding the fight. The issue of self- defense is always a factor in these cases. Read my article on Self Defense for more information on this issue. Pennsylvania defines bodily injury as “the impairment of a physical condition or substantial pain.” A person can commit a simple assault if he or she acts recklessly or intentionally. While a threat can constitute an assault, the law requires that the actor be in a position to actually carry out the threat immediately or that he takes some affirmative steps to do it. In Pennsylvania, the law looks at the defendant’s intent and whether the result of that intent or that reckless act is reasonably foreseeable. The victim’s state of mind is irrelevant unlike the crime of Recklessly Endangering Another Person (REAP) which I will explain later. Simple Assault is graded as a misdemeanor of 2nd Degree unless it is committed during a mutual fight in which case it is a misdemeanor of the 3rd degree. An Aggravated Assault occurs if a person attempts to cause serious bodily injury to another or causes serious bodily injury intentionally, knowingly, or recklessly, under circumstances manifesting extreme indifference to the value of human life. Pennsylvania defines “Serious Bodily Injury” as an injury that creates substantial risk of death or which causes serious injury, permanent disfigurement, or loss or impairment of the function of any bodily member or organ. If the fight with your neighbor over that parking spots goes too far and you seriously injury him, you could face an aggravated assault charge! Aggravated assault also occurs if a person intentionally or knowingly causes bodily injury to certain individuals such as police officers, district attorneys, EMS, or other individuals of a certain classes. If the police are called to your area because of this fight never put your hands on a police officer, fire fighter or EMS. If you touch any of these individuals it is potential aggravated assault if they sustain an injury because of that struggle. Remember that these persons are members of protected class under the law and the DA doesn’t have to establish “extreme indifference to the value of human life” but only serious bodily injury. Aggravated assault can be a felony on the first degree or second degree depending on the degree of harm or attempted harm inflicted and/or the status of the victim (i.e. police officer, etc.). The Pennsylvania Supreme Court has stated that an aggravated assault charge requires that a serious injury or death could occur as a result of the perpetrator’s actions. A court, however, can find an aggravated assault even if the actual injury that results is not considered a serious one. If, for example, a person shoots at someone over a parking spot during this “Blizzard of 2016” and only by good fortune the victim sustains a slight laceration from the bullet it’s still considered an aggravated assault. REAP is a misdemeanor of the second degree and it is committed when the accused person “recklessly engages” in conduct which puts or threatens to put another person in fear of death or serious bodily injury. It is important to understand that this crime focuses not only on the actions of the accused but also on the reaction of the alleged victim. If you are charged with REAP it is critical that your criminal defense attorney attempt to show that the alleged victim didn’t exhibit any sign of fear or apprehension during the incident. Your criminal defense lawyer can do this through a cross examination of the victim which demonstrates that this person initiated an argument or a fight or at the very least acted aggressively during the incident. If your criminal defense attorney only focuses on the action of the accused and doesn’t consider the reaction of the victim, he is putting together a weak defense because in most situations the accused person has demonstrated some show of force either through words or actions.A show of force or communication of force is also an element of Terroristic Threats which, again, is a misdemeanor unless it involves a communication which threatens a group of people in a building or public area (yelling fire in a movie theater). The crime of terroristic threat, unlike REAP, focuses exclusively on the actions of the accused and the reaction of the victims isn’t part of the elements of this criminal charge. Your criminal defense attorney can establish reasonable doubt if he can show that the alleged terroristic threat was a “spur of the moment” reaction which resulted from some argument or fight (“I’m going to punch you in the face or shoot you because I spent 2 hours shoveling that spot”). A spur of the moment reaction doesn’t equate to a terroristic threat and the prosecution won’t be able to establish guilt beyond a reasonable doubt if they can only show that the threat was made without demonstrating that the accused intended to “terrorize” the victim with that threat. So if lose your temper during the Blizzard of 2016 and starting screaming over that parking spot, it doesn’t necessarily mean the prosecution will be able to establish a Terroristic Threat, assuming that your even charged. Stay safe and keep you cool during the Blizzard of 2016! If you would like learn more about criminal defense topics read one of my books or watch one of my videos. These are all available online and in the comfort of your home away from the 20 inches of snow that is expected.